Free Biometric Bike Fittings and Spinal Checks on October 15th to celebrate World Spine Day! Back To School: Backpack Alert! Facilities include: ground floor clinic and ample free parking. 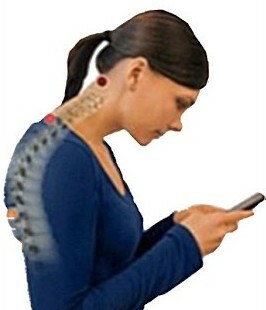 Of course, this posture of bending your neck to look down does not occur only when texting. For years, we’ve all looked down to read. The problem with texting is that it adds one more activity that causes us to look down—and people tend to do it for much longer periods. It is especially concerning because young, growing children could possibly cause permanent damage to their cervical spines that could lead to lifelong neck pain. Now, the easiest way to prevent this is also the most obvious: look up! Or, in other words, look down less. Carry your head on top of your shoulders rather than of in front of them. Straighten up your neck and middle back, which can be done by sticking out your chest. Stand like a champion; they don’t slouch, they stand up straight. In the practice we find that people have been slouching for so long that they find it difficult to stand up straight. Their spine is fixed in a stooped forward or slouched position. That’s where the chiropractor comes in. We are trained to detect your vertebral fixations and your tight and tender muscles. And we can fix them! Next Next post: Spring has finally arrived….Tips for DIY or in the garden!